Gaming chairs have been evolving for years now. As the needs of gamers increase, manufacturers keep finding new ways to meet and exceed those needs. As a result, it’s not uncommon to find chairs that have some impressive features, some of which might even come as a surprise. In this review, you’ll see a great example of this in the X Rocker 51259. You’ll get a chance to take a look at features that extend far beyond just comfort and adjustment options. So without further ado, let’s get into the review. 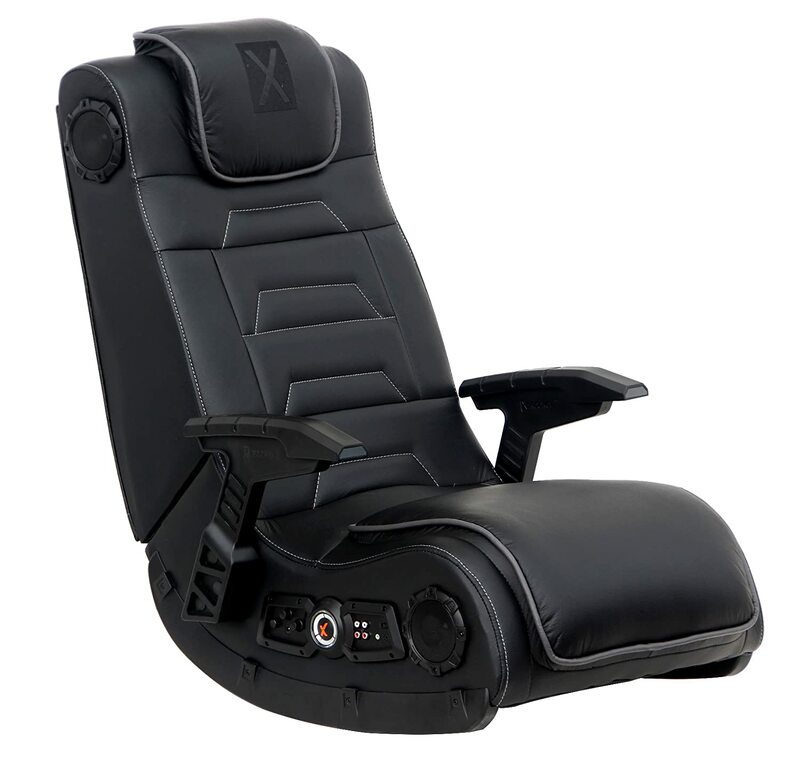 Thanks to their innovative approach, X Rocker entered the gaming chair market with a bang. Ever since, their chairs have been one of the favorite choices of gamers worldwide. The 51259 Pro H3 shows why this is the case. For an affordable chair, it provides amazing comfort, which is of the utmost importance for gamers and streamers that spend many hours in front of the PC. Where this chair stands out from the crowd are its audio capabilities, which will be discussed in detail later. This chair can be a great option for everyone that enjoys an immersive gaming experience. The surround sound paired with the compatibility with virtually all consoles make this chair appealing to all gamers that care about high-quality sound and switching platforms frequently. Of course, not everyone cares about these features. Many gamers will still prefer a pair of premium headphones over an audio gaming chair. They also might look for a chair with a bit more adjustment options. If you’re among them, you might want to consider a different solution. The chair itself comes almost entirely assembled, so you won’t have to do a lot of work before you can get it up and running. However, you’ll still have to do some assembling yourself. The box includes a wireless transmitter which transfers audio signal from an audio source or a headset to your chair. You also get some extra RCA cables for wired hookup. Setting up the chair is a fairly easy task which shouldn’t take long. Obviously, the first thing we need to talk about is the speakers. Whether you’re gaming, watching a movie, or listening to your favorite music, this chair will provide an amazing experience. It features a speaker on each side of the headrest as well as each side of the chair’s seat. There’s also a subwoofer on the back. The vibration motors inside the chair follow the bass, which provides an immersive experience for your entire body. On the right side of the seat, you’ll find the control panel where you can manage the music and connect different devices. As an added bonus, you can connect multiple chairs for the ultimate gaming or theater experience. Of course, the chair doesn’t lack comfort. The upholstery is made of vinyl and there’s a support for your entire back, along with the headrest. Unfortunately, there are no adjustment options, but the chair will fit most gamers without issues. If you need to put it away, you can easily fold it up for storage. It’s safe to say that the number of features isn’t an issue with this chair. All you need to do is find a way to take full advantage of them. It supports virtually every mainstream console, but it still might not work properly with some, so make sure that you’ll be able to connect your devices to it. Before you consider purchasing it, take into account its size. The dimensions of the chair are 29.1 x 22 x 20.9 inches, so make sure that it will fit your room. It should be said that the durability might not be the highest out there. Even though this is expected from a chair in this price range, keep in mind that long periods of heavy usage might affect the thick cushion and relatively flimsy structure. If the features of this chair don’t impress you, there are a lot more choices to choose from. In case you’re not into such technology and would rather have a bit more conventional option, you might want to check out the Devoko Racing-Style Ergonomic Chair. It’s an affordable option that provides plenty of comfort and features more adjustment options, which is always a good thing. If you want to keep up with new technology, there’s no doubt that this chair might be a good option. Many gamers have already made it a part of their setup. If you believe that you could use an upgrade from a classic gaming chair, this one could be a great choice.